In terms of support from the international community, I think these people may be Palestine’s greatest hope! Certainly the United States has been completely discredited as a neutral broker, and while Palestine’s Arab neighbors continue to voice their support for their fellow Muslims, their powerful words never seem to be matched with effective action! The problem is that no country outside of Israel/Palestine really stands to profit from Palestinian independence and, contrary to the rhetoric, no government really pours out its resources for the sake of humanitarian concern. But this is where ‘Anonymous’ comes in! 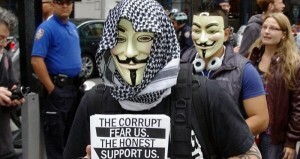 ‘Anonymous’ is not a government. They are a group of ordinary people – rank and file idealists – who aren’t caught up in the power-games and aren’t controlled by big business. Moreover, because they are not a government or a country, no military force, however powerful, is able to shut them down! Last week the hacking group Anonymous launched a cyber-attack campaign dubbed #OpIsrael replacing Israeli homepage messages with anti-Israel slogans and causing massive disruption to government, academic and private sites. The attach reached its peak on Sunday with high-profile government systems such as the Foreign Ministry, the Bank of Jerusalem, the Israeli Occupation Ministry, the IOF blog and the Israeli President’s official website all being hacked. Israeli finance minister Yuval Steinitz said the government was now waging war on “a second front of cyber attacks against Israel.” Haaretz newspaper also said almost 19,000 Israeli Facebook accounts had been attacked by hackers affiliated with Anonymous. The hackers, who stand for “human rights, justice, and universal equality for the citizens of every nation”, started their #OpIsrael campaign because of a threat by Israel to sever telecommunications in and out of Gaza. Hackers from across the Middle East (Jordan, Syria, Lebanon, Egypt, Morocco, Palestine) and also from Indonesia, The United States, France, Spain and Britain all joined together in this campaign to show solidarity with Palestine. A message hosted on the website Anonpaste (an alternative to Pastebin used by the hacktivist collective) explained: “The reasons for Anonymous intervention through #OpIsrael should be abundantly clear: What is happening in Palestine is oppression. They have no navy, no army, or air force. There is no war in Gaza. There is only the continuous application of military force by Israel in an attempt to push every last person out of the Palestinian state, despite international laws that make these efforts illegal.” Their video addressing the Israeli government further explains their aims and grievances. Tags: anonymous, force, government, israel and palestine conflict, palestine, solidarity. Filed under israel and palestine conflict by Father Dave on Apr 17th, 2013. Comment. Tags: father roy, israel and palestine conflict, israelis, solidarity. Filed under Israel and Palestine, israel and palestine articles, israel and palestine conflict by Father Dave on Jan 4th, 2013. Comment.